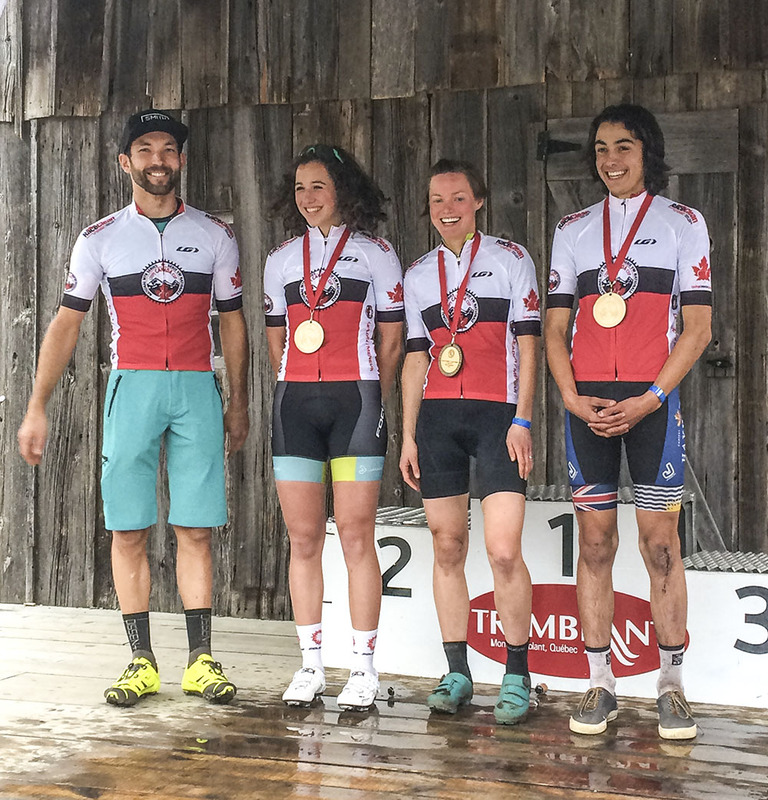 After a break of over two months, the Canada Cup national mountain bike series resumed with VéloMotion at Mont Tremblant, Quebec, on May 21-22 with the second round of the Cross-country series and the opening round of the Downhill competition. Mont Tremblant is one of the longest running venues on the Canada Cup circuit, known for its lengthy climbs and the cobbled sections through the Tremblant village on the cross-country circuit. However, this year the course was changed significantly, reducing the amount of singletrack in favour of gravel fire roads. With rain on the days leading into racing there was some very slippery sections in the trees on the roots and rocks, while the open sections were dry and fast. A perfect mix of conditions that had riders debating on tires choices. Many of Canada's top pros were absent, competing in Europe at the opening round of the World Cup. The Cross-country competition took place on Sunday, with Evan Guthrie (Team Solo Evan) taking his first win of the season in the Elite Men's race, a vindication after suffering a mechanical while in second place at the opening round in Bear Mountain, Victoria. American Sandy Floren (Bear Development Team) was second, over a minute back, with Raphael Auclair (Pivot Cycles - OTE) in third, a further 38 seconds in arrears. "Mont-Tremblant has been the longest standing Canada Cup I've attended since 2008," said Guthrie, "and I was happy to be back after missing it last year. The old course used to be one of my favourites before they shortened it to meet the new school course designs. It was unfortunate this year that we descended on gravel roads, but a race is a race and always gets sorted by the riders' legs." "Raphael Auclair was strong and pushing the pace the first half of the race. Eventually on one of the steep climbs I was able to get away and attacked the descent with my newly installed dropper post, and increased the gap from there. Very pleased to take the first win of the year for all my new sponsors and long-time supporters after all of the winter changes." In the overall standings, Guthrie leads with 320 points, followed by Floren at 265 and Quinton Disera (Norco Factory) at 250. The Elite Women's race saw two B.C. riders take the top spots, with Jayne Rossworn (Independent) beating Emily Unterberger (Independent) by 13 seconds. Frederique Trudel (Pivot Cycles-Ote) took third, 1:32 behind the winner. Rossworn takes over the lead in the standings from the absent Catharine Pendrel (Clif Bar) with 305 points, followed by Unterberger at 244 and Soren Meeuwisse (Trek Canada) at 235. In the Junior Expert races, Holden Jones (Cycling BC) was the men's winner ahead of American Gaelen Kilburn (Hot Tubes), and also becomes the Series' leader with 160 points to Round 1 winner Gunner Holmgren's (Centurion Next Wave) 100 points. Holmgren did not finish at Mont Tremblant. In the Junior Women's category, Leya Masson (CC Mont-Sainte-Anne) won by nearly a minute over visiting Czech rider Tereza Saskova (Ceska Sporitelna Specialized Junior MTB Team). In the overall standings, Sidney Mcgill (Focus CX Canada) moves into the lead after a second in the first round and third at Tremblant, with 155 points. U.S. national team rider Gwendalyn Gibson is second, five points back. 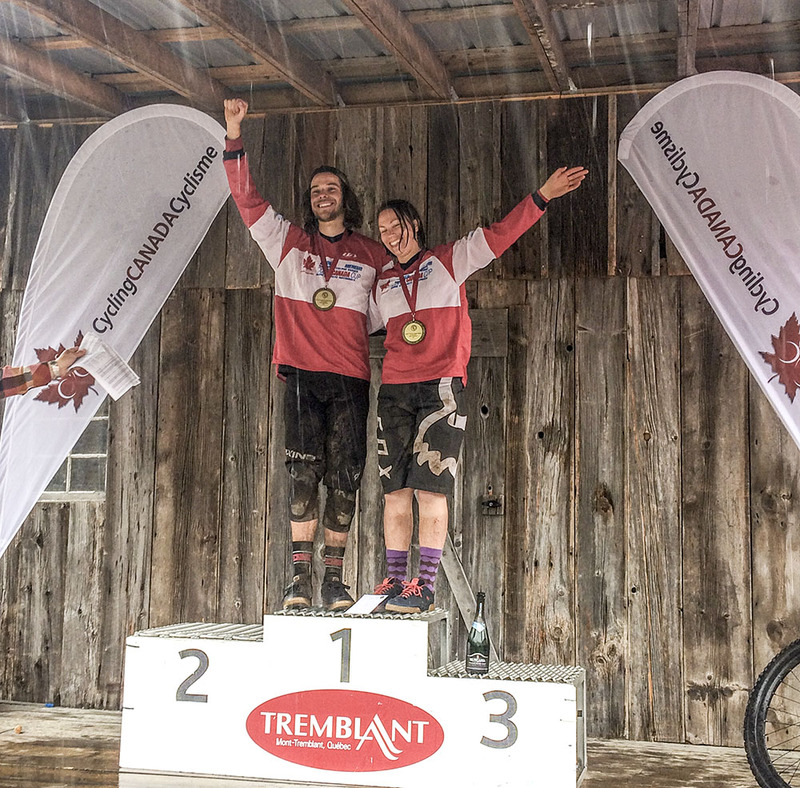 The opening round of the Downhill Canada Cup saw Sarah Konefal (Independent) become the first to don the leader's jersey in Elite Women, finishing 2.128 seconds ahead of Audrée Vaillancourt (Independent) with Maxine Bergeron (Independent) finishing third. In the combined Elite and Junior Men's field, Samuel Thibault (Independent) finished 4.005 seconds ahead of Jonthan Lefrancois (Independent), with Benjamin Despres-Morin (Roost Racing / Sports Aux Puces) finishing third. The top Junior rider was Blake Bunting (Cycles St-Onge) in tenth place. The Cross-country series continues on May 27th at Baie-Saint-Paul, Quebec, site of last year's national championships. On the same date, the second round of the Downhill series takes place with the East Coast Open at Blue Mountain, Ontario.